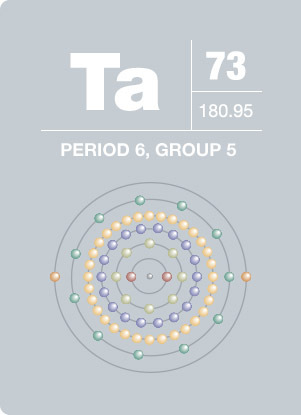 Ta4f region has well separated spin-orbit components (Δmetal=1.92eV). Loss feature for Ta metal appears at ~33eV and ~38eV for Ta2O5. 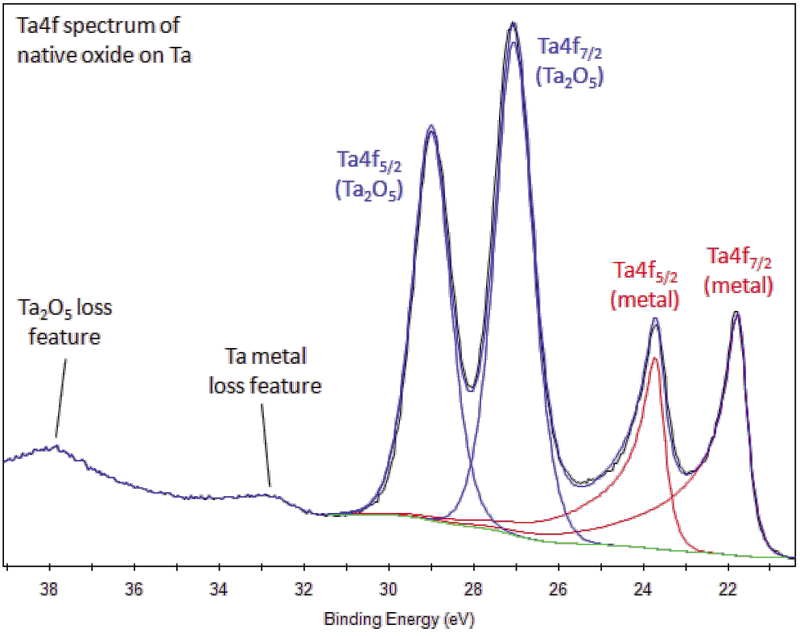 Peaks in the Ta4f region have an asymmetric peak shape for tantalum metal. Tantalum compounds, such as the oxide, have symmetric Ta4f peaks. Use Smart background when sputter profiling films such as Ta2O5 on Ta or TaN on Ta. Linear or Shirley background which is suitable forTa2O5 or TaN will not be suitable for Ta metal. Tantalum oxide is widely used as a depth profiling sputter calibration standard because it can be grown with a controlled thickness by electrochemical methods. Tantalum oxide is reduced by an argon ion beam to form a continuum of oxidation states e.g. Ta2O5, Ta3O7, Ta4O9, etc. Use lowest beam energy possible for depth profiling or gas cluster ion source to clean (if available). This high-melting point transition metal was separated from niobium in 1802 by A. Ekeberg. When pure, tantalum can be drawn into a fine wire for use as a filament for evaporating metals. Due to its high melting point, ductility, and corrosion resistance, tantalum is often incorporated into a variety of metal alloys for use in chemical process equipment, capacitors and aircraft parts. The metal alloy tantalum carbide graphite is one of the hardest metals known, with a melting point of 3738 °C. Tantalum is a non-irritating metal and is immune to body liquids, making it well-suited for use in surgical application.